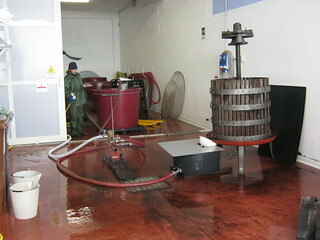 Most of the works this autumn are a bit anticipated, except for the pressing of the wines. I decided to leave the yeasts at peace to be able to finish their job well without disturbing them with longer than average skin contact due to the relatively high sugar levels. The summer and autumn have been extremely dry and the hydric stress of the vines correlate with difficulties of the yeasts during their multiplying faze. I decided to leave the wines a longer on the skins before pressing in order to have a maximum population of yeast strains in the juice to be able to transform the sugar without problems and to have maximum stability with near-zero residual sugar in the wines. Our old vertical press is still working well after all those years although we are hitting the limit with this press for wines like Contadino and Susucaru as the volumes are bigger compared to a few years ago. For next year we will be able to choose either to go manual for Magma, the MunJebel crus and some “special” wines I have in mind, or to use the “new” second hand pneumatic press which will give us a quality advantage in vintages with thinner and more fragile skins such as 2010 so that we can work faster with less oxygen exposure on the wine and the skins. A continuous search to improve our work through experience, following consequently our intuitive quality guidelines to express non-compromise terroir wines. This entry was posted on Monday, December 17th, 2012 at 9:12 pm	and is filed under Work in Progress. You can follow any responses to this entry through the RSS 2.0 feed. Both comments and pings are currently closed.